Was This Plastic Helmet the 1940s' Solution to Smog? When smog first descended on Los Angeles as a thick, grey mist in the 1940s, it caught the city unprepared. What were Angelenos—their eyes watery, their breathing labored—to do? Don plastic helmets and walk around in their own private atmospheres, like astronauts on a alien planet? Not exactly, but that's the first impression given by this 1947 photograph, captioned "smog protection experiment." 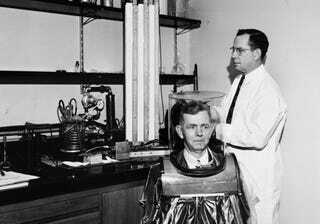 Instead, it turns out that the two University of Southern California researchers here, E. A. Swenson (seated) and H. Roth (standing), used the plastic helmet and body suit to test smog's effects on the body, pumping polluted air into the helmet and then observing the subject's reactions. This experiment was part of a broad effort waged by USC and other California research universities toward understand this new and mysterious weather phenomenon. Scientists quickly discovered smog's chemical makeup, but it wasn't until the 1950s that they agreed upon its primary cause: automobile exhaust. Image courtesy of the USC Libraries – USC University Archives.